Many taxpayers are unaware of the method of accounting used for their business income tax returns. And, many businesses are unaware that a different accounting method may also be used for their financial statements. Yes, effectively, creating two sets of books. Typically, the two most common accounting method choices are the cash method and the accrual method. Use of the cash basis method of accounting (if eligible) will usually result in lower income taxes than the accrual method for a particular period of time. This is especially true when a business is growing. However, if a business is experiencing a decline in revenues, additional taxes may be incurred as a result of reporting on the cash basis. 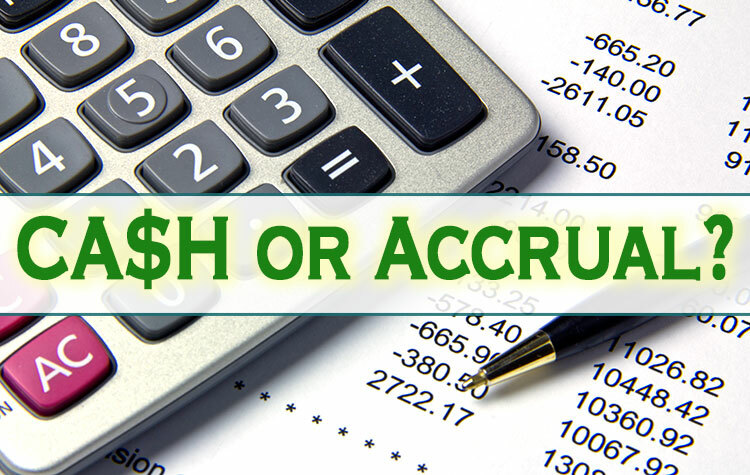 On the other hand, accrual basis accounting will often show the largest bottom line on your financial statements. This may be important when reporting your financial results to your bank and/or your bonding company. Both always enjoy seeing good news. Thusly, these two methods may show significantly different results, even when accounting for essentially the same transactions. One may wonder how that could be. Well, the cash basis reports only taxable income when it is received in cash. Also, under this method, a tax deduction does not occur unless a cash disbursement for an expense has occurred. The accrual method shows the income once the sale is completed and the expense when incurred which can more accurately reflect your net income. The choice of an accounting method is a big one. Its importance grows with the size of your business. If you ever decide to change methods, please remember that some changes require Internal Revenue Service approval, while others are automatic. Regardless, your accounting method choice should be evaluated on an annual basis.